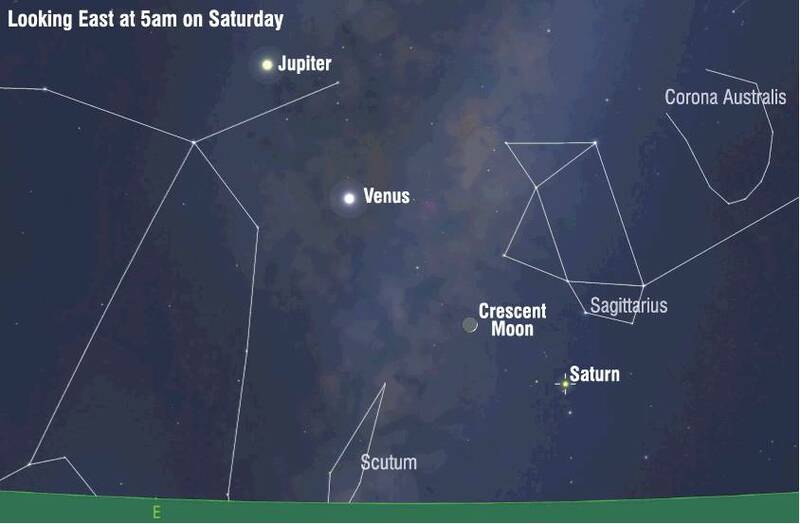 The sight of Jupiter, Venus, the crescent moon and Saturn will be worth getting up early for, writes Ian Griffin. Tomorrow, I will be taking leave from my day job and heading up to the University of Canterbury's Mount John Observatory, above Lake Tekapo. I will be spending four nights there, and using the 0.6m telescopes to gather data on some of the most beautiful objects in the southern sky. I am sure you can imagine how excited I am about the trip. I hope to share some of the pictures I obtain in next week's column. My observing run corresponds with the so-called ''dark of the moon'', the period in the month when the moon is below the horizon for most of the night. This makes conditions perfect for my project, which aims to photograph dim nebulae and galaxies. With the new moon occurring on February 5, the sky won't be completely dark all night because the moon will be visible as a thin crescent, rising just before dawn. Although I will be spending most of my time at Mount John sitting in the telescope control room, I fully intend to step outside just before sunrise on Saturday, in order to take in what promises to be a beautiful celestial scene, with the moon and three planets on show in the eastern sky. While I'm sure the sight of Jupiter, Venus, the crescent moon and Saturn rising over the Southern Alps will be memorable from my Mackenzie Country viewing perch, that same vista will also be visible across Otago, so it is well worth making the effort to see it. Our chart is drawn for 5am this Saturday (February 2). The crescent moon (which rises at 3.45am) will be just under 9% illuminated and should be a magnificent sight, some 10 degrees above the horizon. Above and to the left of the moon, Venus will appear as a stunning blue/white ''star'' and above and to the left of Venus, Jupiter's bright-yellow colour will make it easy to discern. Below and to the right of the moon, Saturn will complete the glorious cosmic quartet. So go on. Set your alarm early on Saturday, you won't regret it!